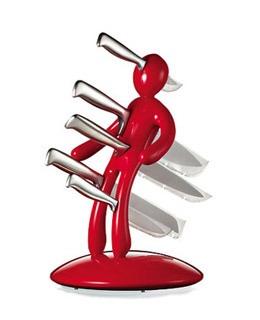 The terrific shopping blog mightygoods.com first turned us on to Perpetual Kid's site and the Ex, a stainless-steel knife set with "cathartic" voodoo-style holder, for $70. Blades slide in and stay put thanks to magnets inside each body part-er, knife slot. We also dig the site's tiny elephant bottle opener (the trunk works the cap free) for $8 and the plastic "human" soap dispenser, also $8; pump the round head, and liquid cleanser squirts out of the mouth.